Amtrak’s inability to reach faster speeds along the Northeast Corridor is, to a considerable extent, also attributable to the bottleneck of trains that congest travel in and out of New York Penn Station. On a given weekday, Penn Station sees approximately 435,000 riders boarding and alighting approximately 1,200 revenue trains within the station. Penn Station is served by three regional rail systems: MTA LIRR accounts for approximately 235,000 boardings and alightings, or 54% of daily riders on a given weekday; NJ Transit accounts for approximately 170,000 boardings and alightings, or 39% of daily riders on a given weekday; and Amtrak accounts for approximately 30,000 boardings and alightings, or 7% of daily riders on a given weekday. Amtrak’s Northeast Corridor service accounts for approximately 26,000 daily riders, and Amtrak’s Empire Corridor accounts for approximately 5,000 daily riders. Amtrak owns and maintains Penn Station, including its concourse, tracks, and platforms. NJ Transit and MTA LIRR lease concourse space and trackage rights from Amtrak, and each system’s concourse is styled and maintained independently of one another. Since it began operations in 1976, Amtrak has increased service along the Northeast Corridor into and out of Penn Station by nearly 40%, adding an average of one to two daily weekday trains each year. In comparison, NJ Transit has increased its service by 200%, adding nearly 300 daily weekday trains over the same period. MTA LIRR has increased service by over 50% since 1976. The tremendous growth of Penn Station’s train traffic has resulted in an unsustainable level of congestion throughout the station’s 21 tracks. Coming from New Jersey, NJ Transit and Amtrak use the 100-year-old pair of single-track North River Tunnels to accommodate over 500 daily trains. At maximum capacity, the two tunnels can transport only 24 inbound or outbound trains per hour, or 38 total trains per hour. In order to squeeze as many trains as possible into Penn Station, track assignments are made as space becomes available. 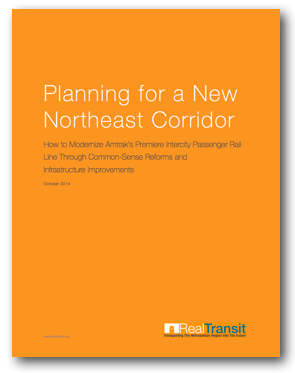 In addition, Amtrak shares all of its track and platform space with either NJ Transit or MTA LIRR. 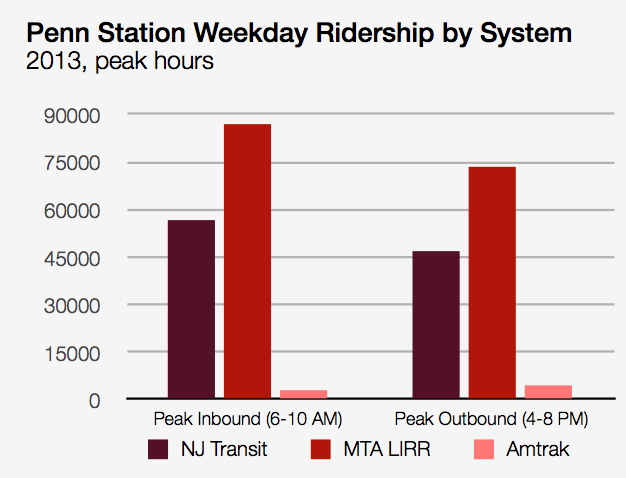 During peak hours, Amtrak’s ridership within Penn Station is dwarfed by its commuter railroad counterparts. 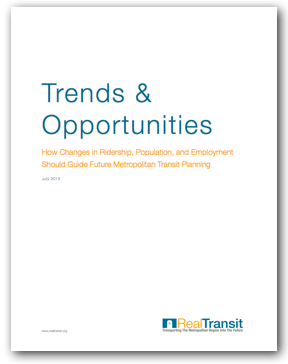 Where NJ Transit and MTA LIRR combine for a peak ridership of over 300,000 passengers, Amtrak ridership totals just 15,000 passengers, or 5% of total ridership, during peak hours. In order to alleviate crowding within the station, it would be beneficial if, at the very least, trains from each system could arrive and leave from any available track and platform at a given moment. However, because of Penn Station’s century- old infrastructure, the opposite is true. Tracks 1 to 4 are accessible from the North River Tunnels, but do not connect to either pair of East River Tunnels traveling to Long Island and points north. Thus, Amtrak trains arriving from the southern section of the Northeast Corridor and utilizing a single locomotive cannot terminate at Tracks 1 to 4 because of their inability to turn around in the station or continue towards Boston. Amtrak Empire Service trains coming from the Hudson Line through the Empire Connection are only able to terminate at Tracks 1 to 8 (and part of track 9). However, because Tracks 1 to 4 are exclusively powered by overhead wire and Hudson Line trains use third rail power, Amtrak’s Empire Service must terminate exclusively at Tracks 5 to 8. Coming from points north and east, the southern pair of East River Tunnels only connects to Tracks 5 to 16 (and part of 17). The northern pair of East River Tunnels only connects to Tracks 15 to 21 (and part of 14). The only full-length tracks that can access both the northern and southern pair of East River Tunnels are Tracks 15 and 16. Tracks 18 to 21 are accessible to Amtrak trains coming from the northern portion of the Northeast Corridor, but the overhead wire is currently nonfunctional. Today, these tracks are used exclusively by MTA LIRR. Finally, while Tracks 18 and 19 connect to the North River Tunnels, Tracks 20 and 21 do not and, thus, cannot serve Amtrak trains traveling on the southern portion of the Northeast Corridor. The inability of a given train to access any available track and platform limits accessibility for all passengers and results in additional congestion within Penn Station. Unlike Grand Central Terminal, which has a large number of tracks that allow for track assignments to be announced in advance, Penn Station passengers often have just minutes to learn their track assignment and board their train. Delays that impact one section of the station or its tracks often cause problems throughout the entire rail network. In sum, because of a lack of track redundancy, acute problems can result in broad system stoppages and cause even greater congestion within the already overcapacity Penn Station. The tracks leading from New Jersey and Long Island into Penn Station also present a number of infrastructural obstacles to achieving faster speeds on the Northeast Corridor. Coming from Newark Penn Station, the four main tracks of the Northeast Corridor merge into three tracks after the Dock Bridge and eponymous Dock Interlocking. 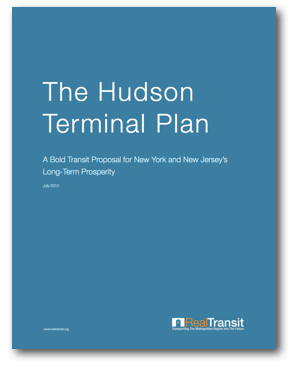 At Rea and Hudson Interlockings, the Northeast Corridor crosses over NJ Transit’s Morris and Essex Lines, whereat the third track diverges into the Waterfront Connection to bring diesel-powered trains to Hoboken Terminal. Midtown-Direct NJ Transit trains join the Northeast Corridor at Swift Interlocking, at which the two-track Northeast Corridor travels over the 100-year-old Portal Bridge towards Secaucus Junction. In total, there are ten interlockings in between Newark Penn Station and New York Penn Station, each with its own speed limit and restrictions. From Penn Station to Hell Gate Bridge, there are another four interlockings that are shared with MTA LIRR and further restrict train movement. 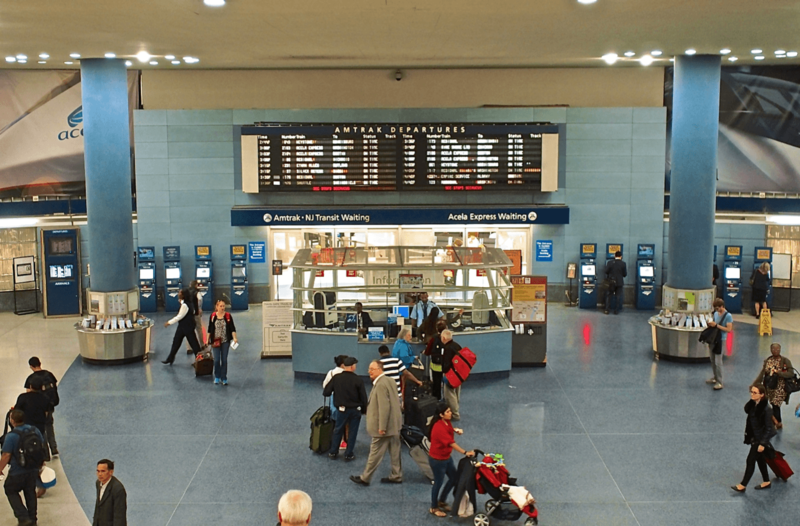 While proposals to expand capacity within Penn Station would help alleviate some congestion along the Northeast Corridor, in order to achieve true high-speed service, significant changes must also be made to the tracks leading to and from Penn Station.